Self-esteem is an individual assessment that leads to self-evaluation of the results achieved, which are influenced by attitudes, interactions, rewards, and acceptance of others towards the individual. To measure self-esteem in this study using a questionnaire of self-esteem that has a value of total item validity with an R-value of 0.220, and reliability of 0.945, it can be concluded that the questionnaire is reliable and feasible to use as a research instrument. This study aims to determine the effectiveness of the rational emotive behavior group counseling to improve self-esteem of high-school students. This type of research is quantitative with the design of Experiment Pretest and Posttest Control Group Design. Data were analyzed by two nonparametric statistical test`s Independent Mann-Whitney U Sample Test. The results of the hypothesis obtained by the Z value of -2.120 and Asymp numbers. Sig. (2-tailed) which is 0.034, which meant it is smaller than the real level (α / 2 = 0.05), then Ho is rejected, meaning that the counseling of rational emotive behavior groups is effective to improve self-esteem of high-school students. The research was carried out starting from February to July 2018, which took place at SMA Negeri 1 Kutorejo. Based on the results of the research, researchers give suggestions for (1) teacher of Counseling Guidance could apply this rational emotive behavior group counseling as an alternative strategy to improve students’ self-esteem; (2) furthermore, researcher could apply rational emotive behavior counseling on the other psychological aspects or using different techniques for group counseling, so they could learn new knowledge. Coopersmith, S. (1967). Antecedents of self esteem. San Fransisco: W.H. Freeman and Company. Corey, G. (2013). Teori dan praktik konseling dan psikoterapi. Bandung: PT Refika Aditama. Geldrad, K., & Geldrad, D. (2011). Konseling keluarga. Yogyakarta: Pustaka Pelajar. Habsy. (2014). Keefektifan konseling kelompok untuk meningkatkan harga diri siswa SMK. Tesis tidak diterbitkan. Malang: PPs UM. Hasibuan, R.L. & Wulandari, L.H. (2016). Efektivitas rational emotive behavior therapy (REBT) untuk meningkatkan self esteem pada siswa SMP korban bullying. 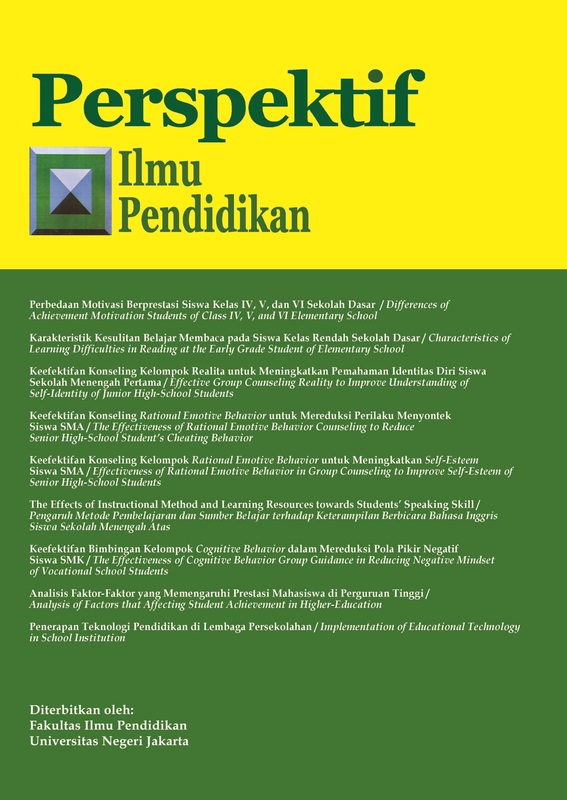 Jurnal Psikologi, 11, 103-110. Jones, N. (2011). Teori dan praktik konseling dan terapi. Yogyakarta: Pustaka Pelajar. Kumalasari, G., Eka, W., & Karsih. (2011). Teori dan teknik konseling. Jakarta: PT Indeks. Maynawati, A. F. R. (2012). Penanganan kasus low self-esteem dalam berinteraksi sosial melalui konseling rational emotif teknik reframing. Indonesian Journal of Guidance and Counseling: Theory and Application, 1(1). 15-22. Nursalim, M., & Suradi, S. A. (2002). Layanan bimbingan dan konseling. Surabaya: UNESA University Press. Suhron, M. (2016). Asuhan keperawatan konsep diri: Self esteem. Ponorogo: UMPO Press. Sukmadinata, N. S. (2003). Landasan psikologi proses pendidikan. Bandung: Remaja Rosdakarya. Young, G. G. (2012). Membaca kepribadian orang. Yogyakarta: Diva Press.